Grew up... as an orphan in South Boston. Will spent his childhood drifting from one miserable foster home to the next. With no real family to ground him, Will found solace in the company of a tight-knit group of friends, and books from the public library. Living... in a rough, working class Irish neighborhood in south Boston. He lives near his childhood friends, Chuckie, Billy, and Morgan. The gang has never fully shed the aggressive, reckless energy of youth, and constantly find themselves drawn into trouble. Profession... janitor at the Massachusetts Institute of Technology. Will thinks that there’s a working-class nobility in emptying trash cans and doing what needs to get done – but while walking the hallways of MIT he is constantly reminded that his potential is being wasted. See, while Will doesn’t have much in the way of formal education, there’s no doubt that he’s a genius, who can easily solve problems that puzzle even the most intrepid math students. Interests... getting drunk with his friends, hitting on girls, and learning incredible amounts of complex information. Will spends his private time cultivating his genius, but likes nothing more than getting into trouble with his childhood friends. Unfortunately, one of their latest outings ended in a fight that landed Will in jail. He’s offered his freedom on two conditions: first, he has to put his mathematical genius to work by helping professor Gerald Lambeau, and second, to start seeing a psychiatrist. Relationship Status... seeing a Harvard girl named Skylar. She’s the complete package – smart, beautiful, and sweet – but from a totally different world than Will. Resentful of her wealth and privilege and scared of his anything that will move him away from south Boston, Will seems destined to torpedo their burgeoning romance. Challenge... living up to his potential. Will is bombarded on all sides by people pushing him to do something more than he is – even his friend best-friend Chuckie is on his case, telling Will, “You have a winning lottery ticket, but you’re too much of a wimp to cash it in.” But Will didn’t ask to be a genius, and he knows that embracing his genius will remove him from the world he’s known his whole life. Personality... cocky, brash, and combative. While he is often crude, Will’s quick wits mark him as unmistakably intelligent. A lifetime of dealing with drunks and bullies have taught Will to never flee from a fight. It is almost impossible to breach his outer façade, much to the chagrin of his psychiatrists. However, in the opinion of Sean Maguire, the only counselor to make any progress, Will is extremely scared. 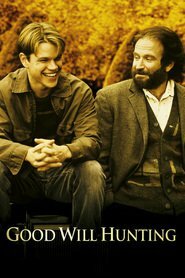 Will Hunting's popularity ranking on CharacTour is #1646 out of 5,000+ characters. See our top-ranked characters and read their profiles.